An Egghead is anyone in the world who owns a Big Green Egg ceramic smoker/grill. We have been described as "cult-like" in our enthusiasm for the "Egg" and we cherish that title. Not only is "Egg'n" fun, it produces unbelievably delicious food. Eggfests are informal events where Eggheads gather to share food, recipes and friendship without the stress of competing for awards or recognition. We simply enjoy each other's company. 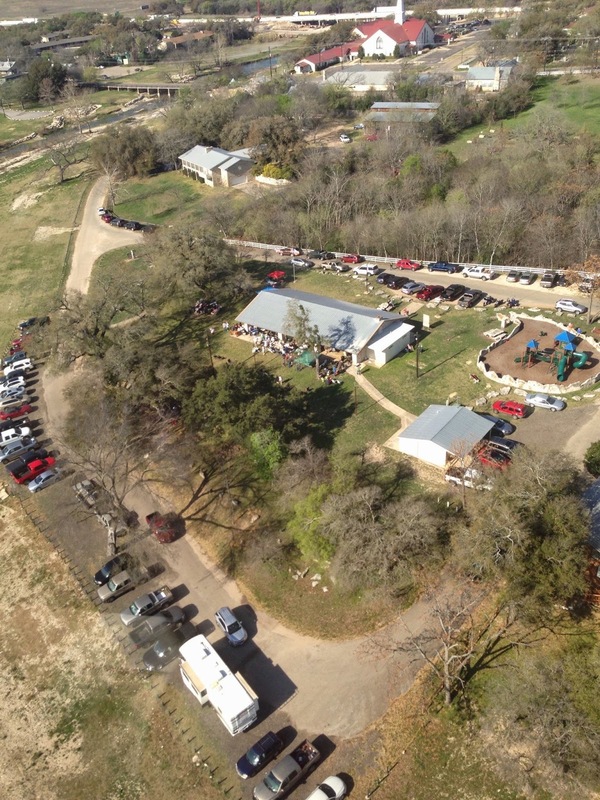 The next Salado Eggfest is in Salado, Texas on March 14, 2015. I've decided that I will no longer maintain this blog for the Salado Eggfest, but I will leave it up for the time being for those checking here for information. Yes, there will be a Salado Eggfest 2017 and it will be held March 11, 2017. It will be held at Pace Park in Salado. Someone should be able to help get you registered. Mickey announced last year that it was his last year to organize the Salado Eggfest which he started years ago. We knew there would be changes as someone else took on the responsibility and burden of organizing it and thought we could adjust to them. Meanwhile, there was a tragic accident that resulted in the death of one of the key players and co-owners of The Inn on the Creek, the host B&B and primary site for pre and post Eggfest parties. Add to that the less than enthusiastic attitude of the new manager at the host dealer, and it was looking like the Salado Eggfest would be discontinued. But earlier today I learned that the Salado Eggfest will go on. Will at Inn on the Creek, and Ace Hardware of Salado will make it happen. All the details will have to come from the new organizers. Like Mickey, I'm stepping back and letting someone else run the show. But I plan be there to cook and have fun. So this will probably be my last entry in this blog regarding Salado Eggfest updates. A number of folks have asked if there was going to be a 2016 Salado Eggfest now that Mickey has stopped organizing it. I don't know. No one has contacted me about a firm date or what kind of agenda, or any of the many details necessary for me to report them here. So, like everyone else, I wait. From all the comments I've heard and read, it was the best one yet. Although I missed most of it due to a really bad cold, I did get to see a lot of people and even cooked for a couple of hours, but I had to call it a day and return to my hotel room. The weather was perfect and we had a great turnout, probably in excess of 400. I heard many reports that the food was outstanding. Mickey announced that this would be his last year to organize the Salado Eggfest. Now that he's retired he wants a less complicated life. He has certainly earned it and has done a wonderful job of making it one of the top Eggfests in the Country. I'm sure the name of the person assuming the job of managing the Eggfest will be announced soon and I will post it here. Hayden Coburn, Store Manager at Keith Ace Hardware, the Host Dealer, is the likely person but we'll have to wait to see. This was his first Eggfest and he sure appeared to be enjoying it. And if tradition holds true for the Salado Eggfest date for 2016, it will likely be either March 12th or March 19th. The final event of the day was to give away two Mini-Max Big Green Eggs as door prizes. Salado was the very first Eggfest in the country to give away Mini-Max's as a door prizes. They were won by two very lucky people. I'm sure they will thank their lucky stars for coming. Thanks to everyone who came and helped make it a wonderful event. See you in Salado next year. We expected 300 to 400 Attendees and we were not disappointed. The weather was great, well except for a short rain shower, and the temperature was perfect. We expect the same or better for 2015. So, if you're either thinking about coming to Salado, or definitely coming to Salado, now's as good'a time as any to pen a reminder to Register sometime in January or February 2015. And as always, a team (namely me) will be standing by to receive and process your registrations. Registering now will save you and us a lot of time later. We hope to open the on-line registrations for the 2015 Salado Eggfest by January 1, 2015. Here's the registration link: http://saladoregistration.blogspot.com/ whern the time comes. It's Official. March 15, 2014 at Pace Park is the approved date and place of the next Salado Eggfest. More news will be forthcoming about hotel and B&B rooms, door prizes, registration, etc, but we've still got a few days to work out the details. Those days go quickly too. The best thing is it's still free to all. And we will have four Mini Eggs and maybe some other goodies going home with someone. Again, it's not too early to start thinking about what you plan to cook or where you will spend the weekend: hotel or B&B or RV Park. Remember also, that Salado has many wonderful shops and restaurants to visit while you're in town. I know March 15th is the Ides of March, and some of you will be drawn to wearing your togas, but it is also St. Patrick's Day Weekend and perfect for wearing your kilt or Irish Green. Of course, other forms of dress are the accepted norm, but where's the fun in being normal??? Come on, plan your March 15th weekend to be in Salado, either as a cook or as a taster. What better way to spend it? Oh, and you can feel free to forward information about the Salado Eggfest to your friends and family, near and far. It's a great opportunity for a family gathering. And while you're at it, check out the new Salado Forum. Yes, we now have our own Forum. Click Here or the link is at the top of the Links List to the right. This was the third Salado Eggfest and it was the best yet. The crowd was larger, the weather better, the food tastier, the park prettier, and the Village of Salado more welcoming. Mickey has become a Master at holding Eggfests, and Russ and his crew at Keith Ace Hardware did an outstanding job of setting up the Demo Eggs for the Cooks, and operating the Big Green Egg Accessory Store. The Eggfest, the Meet & Greet party Friday night and the After Party Saturday night went off without a hitch. And what can I say about the Cooks... You guys were fantastic! Not only were there lots of simple but tasty dishes, there were a lot of very creative dishes that one would not expect to see outside a professional kitchen. We hope to gather recipes from everyone and post them on this site for all to try. Of course, being St. Patrick's Day weekend and Salado being a host town for a major Scottish Clan Gathering each year, a few of us wore our kilts and Irish Green. If you plan to attend the Salado Eggfest, it would help if we have some information so to better plan for the event. If you would please copy and paste the following questions to an email to springchickentexas@comcast.net, then fill in the space beside each question. Yes, I plan to be there.